THERE IS AN EPIDEMIC IN THIS COUNTRY, one that continues to spread despite fluctuations in the economy. A dishearteningly large number of people dislike what they do for a living. 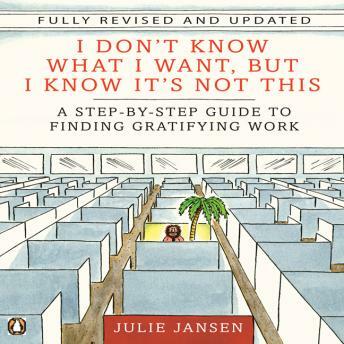 In this revised and updated edition of I Don't Know What I Want, But I Know It's Not This, career coach Julie Jansen shows how anyone unhappy with their employment-or lack of-can implement a real and satisfying career transformation. A range of quizzes and personality exercises help you to identify the type of work for which you're best suited, and then, using real-life examples and a useful resource guide, Jansen shows you how to transform even a period of crisis into an opportunity, providing the inspiration and know-how to effect positive change.